The easiest and best way to request technical support for TradeLog is directly from the software. By submitting a support request from the software you will include your TradeLog file and necessary logs that will help our support team quickly and accurately diagnose the problems you are having and provide the most specific instructions. All data files sent to TradeLog Support can only be accessed by authorized TradeLog staff with password credentials. Your social security number is not stored in any files sent, any account credentials are encrypted. Open the data file you wish to send and click the Get Support button on the toolbar. Or, go to the Help menu, and choose Get Support For This File. Your name and e-mail address should already be in the fields provided. 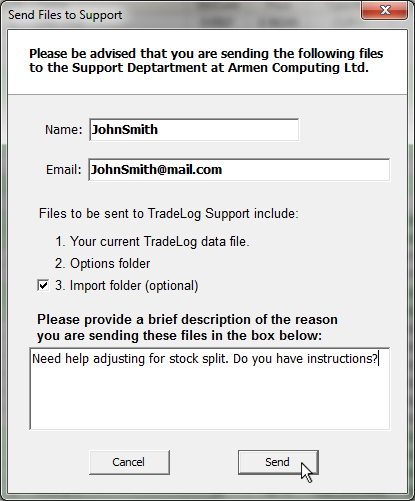 Leave the import folder box checked as this will help us to work on your file. Please provide us with as many details as possible of the problem your are experiencing so we may better help you. 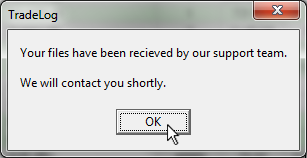 A TradeLog support representative will respond to your request typically via email as soon as possible.